Glad you liked ‘The Finishing Touch.’ We were kind of disappointed with it here—felt that it wasn’t up to our standard. Just received yours of the 11th.inst. I also got the one dated in January, for which you really must excuse me for not answering, but to tell you the truth, I have'n't had much time for correspondence this last few months. Firstly, my Wife presented me with a Baby Girl last December & two or three months later had to go back to the hospital again for a major operation & have just got her home again, so what with trying to make pictures & taking care of the family you can fully understand how busy I have been & I trust you will pardon me this time. I note in your letters that you have been keeping in close touch with our Comedies & am delighted to know that you like them so well. It certainly is encouraging & your criticism is greatly appreciated - Very Many Thanks. Glad you liked 'THE FINISHING TOUCH', we were kind of disappointed with it here, felt that it was'nt up to our standard - maybe it's good that we feel that way sometimes - makes us try to do better. Of course we can't expect to do knockouts every time especially as we make a picture in eight to ten days & ideas for material do'nt come easy, so we must consider ourselves pretty lucky up to now. 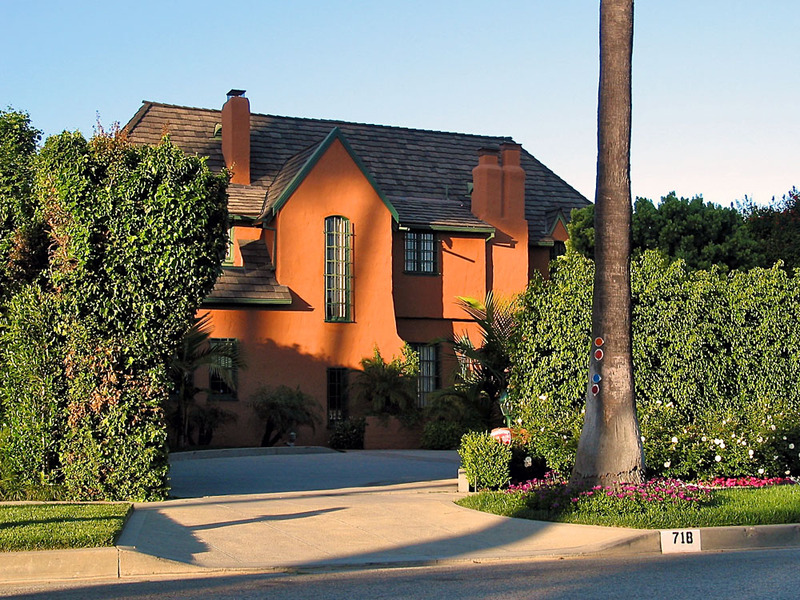 Stan and Lois Laurel moved into this large Beverly Hills home in 1928 after the birth of their daughter Lois. They resided in this home until 1930. It was an incredibly productive period during which Laurel and Hardy filmed Big Business, Double Whoopee, and their first talkie: Unaccustomed As We Are, among others. During that period, the pair also lensed The Rogue Song, one of the most sought after lost films of the Golden Age of Cinema. Your letter of April 7th was received by me this week. I am sorry that I was delayed in receiving it as well as answering it, but each year our Studio suspends operations for one month and April happened to be the month this year, so consequently did not get your letter until I returned from my vacation. It is very gratifying to receive such an awfully nice letter from you and I wish to assure you of my appreciation for same. I hope that our pictures in the future will be funny enough to keep you as you term it "Our Fan and Admirer". What do you think of the Talkies? Up to now I don’t think so much of them. Of course they are not perfected yet by a long way and I think will take quite a while before they are. It is a wonderful thing, but I like the silent ones better. Very many thanks for the box of Salt Water Candy received safely yesterday. It is greatly appreciated - very thoughtful of you indeed. I am having some dental work done at present, so am unable to try the candy & tell you how good it is - but just wait till I get my teeth! I anticipate you are having your vacation, trust you are having a real good time - I played in Atlantic City a couple of times at the Globe Theatre & the Keith House on the Boardwalk - had a wonderful couple of weeks, enjoyed it immensely. Have you seen any of our latest pictures? We have one running at the Embassy Theatre New York "TWO TARS" They are giving it quite a lot of advertising so I guess it must be going O.K. Everything here is just as usual, working hard & still trying to make funny pictures. What do you think of the Talkies? Up to now I don't think so much of them - of course they are not perfected yet by a long way & I think will take quite a while before they are. It is a wonderful thing, but I like the silent ones better. I, myself, am no way near the top yet after twenty odd years of hard work. Please pardon the delay in answering yours of January 19th. but I have been so darned busy, I haven't had much time for correspondence. Have just finished our third picture since vacation (Six weeks) so you can imagine how we have been going. We are getting ready to start on our first talking picture next week, so we will soon find out whats in store for us. Note you are studying to be a lawyer - I think you are very wise to have a profession, in case you failed in your ambition to become an actor, as you must realise what a tough business the Stage & Screen is, at its best it is very uncertain, & after years of struggles & hard knocks. I myself am no way near the TOP yet after twenty odd years of hard work & I sometimes think "is it worth it". Many a time I wished I had some other profession, but being born of a Theatrical Family I know nothing else but the Stage, so just had to stick to it & let the fates decide. But don't let my experience influence you, if you feel you could make good, go to it, no one knows but themselves. Well I will close now Duncan, shall be glad to hear from you any old time & any help I can give you to attain your ambition, I shall only be too delighted. Many thanks for yours of July 5th. with enclosure of press clipping. Glad you liked our first talkie. We have made five of them up to now & are beginning to get used to them, at first it was kind of hard for us, but we are now finding out little tricks of the trade. We have Harry Langdon working at the Studio now, he is an awfully nice fellow & I think a really funny comedian. Well I am getting ready to go on my vacation for a couple of weeks. I am going to do a lot of fishing, as I am looking forward to a lot of fun. Well we'll close now Duncan, trust all is well with you. 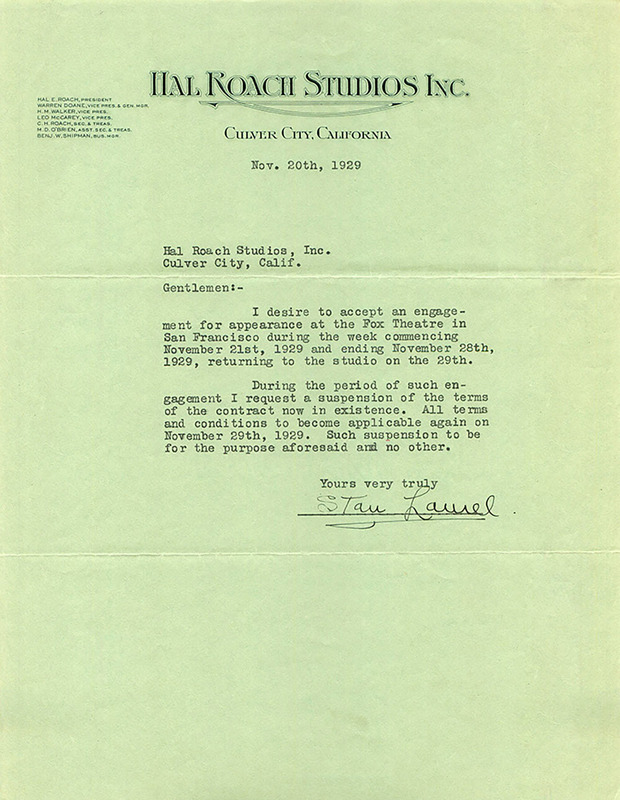 I desire to accept an engagement for appearance at the Fox Theatre in San Francisco during the week commencing November 21st, 1929 and ending November 28th, 1929, returning to the studio on the 29th. During the period of such engagement I request a suspension of the terms of the contract now in existence. All terms and conditions to become applicable again on November 29th, 1929. Such suspension to be for the purpose aforesaid and no other. 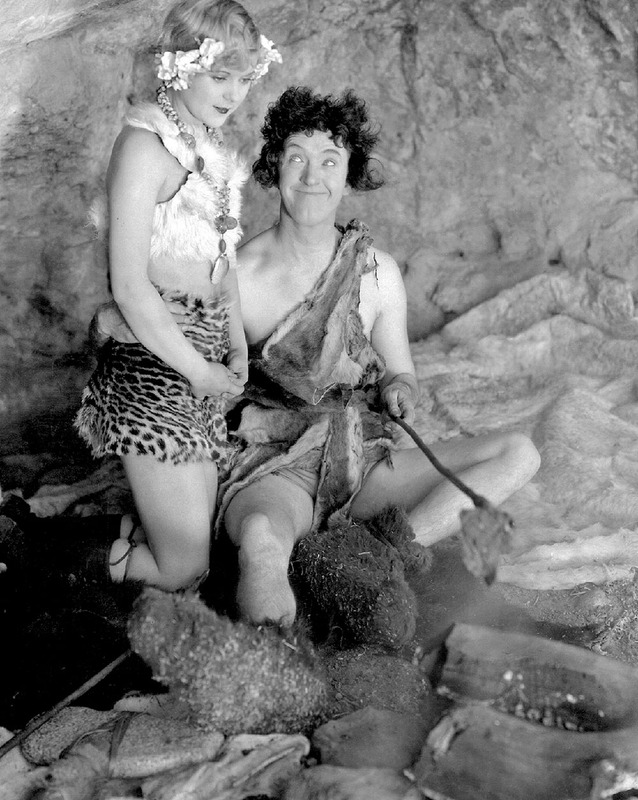 The two-reel comedy, far from being a rickety and unimportant relic of “custard pie” days, now is likely to take a bigger place in the sun than ever before, according to Hal Roach, producer of comedies for Metro-Goldwyn-Mayer, who arrived in New York recently to confer with Eastern executives. Mr. Roach, who has a football build, a cheery, smiling face and is known on the Coast as an excellent polo player, has done a considerable amount of globe trotting since last December. At that time he and his wife set out from San Francisco for the Philippines and Japan. They visited China, the Malay Peninsula and India, and then went on to Italy, France, New York City and the Coast. Now, after starting his studio off on its production schedule of forty comedies for 1928-29, he finds himself back in the East. In discussing what he believes to be a new rise in the popularity of the two-reel comedy, Mr. Roach laid stress on quality and originality. Sound is welcomed by Mr. Roach as a highly interesting innovation and one having a special bearing on comedy production. 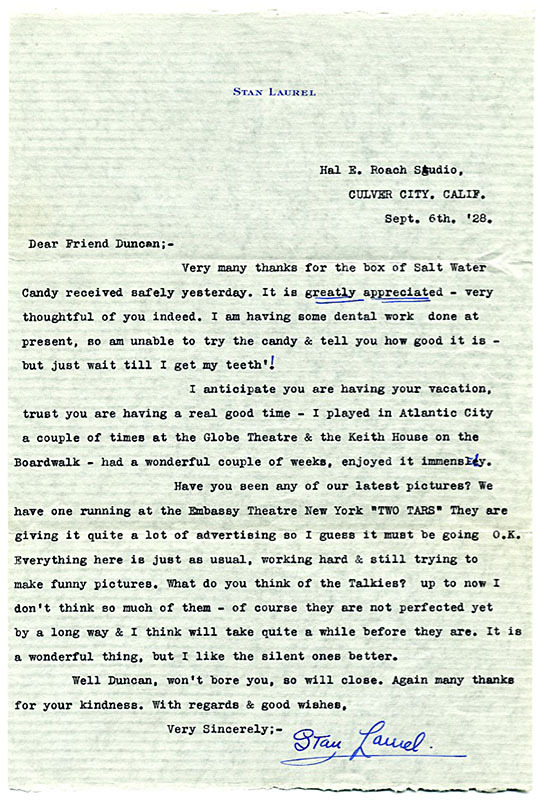 It is Mr. Roach’s opinion that sound will exert an important influence in cutting down metropolitan stage presentations in film houses. He looks for a rebound from what he calls the present “overbalancing” to an accepted all-picture program, with sound providing the novelty sought for by city showmen who went in heavily for miniature musical comedies to supplement their cinema programs. The comedy producer speculated on the possibility of establishing a Broadway house where nothing but short subjects would be shown. “I have often wondered,” he remarked, “what would be the result of an experiment in which a big theatre could be turned over to the exclusive showing of short feature material. What would be the public reaction? Would there be enough patronage to insure a fair profit? I believe so. Anyone can see how comprehensive the field is by just glancing at the current schedules of the leading producers. More comedies were turned out last year than ever before. Besides the news reel, which is a ‘must’ everywhere. Forty per cent more two-reel films are shown in first-run houses than was the case three years ago. The UFA ‘Oddities’ have proved popular and then there are the Technicolor specials, nature studies, the Music Master series, lessons in bridge—in fact, a variety that seems to increase all the time. One of the things which was most impressed upon him during his recent foreign trip, the comedy producer said, was the necessity of careful discrimination in sending two-reel pictures to the Orient. The Chinaman, for instance, utterly falls to appreciate many stock American jokes. The icemen and the bill collector are thoroughly meaningless figures to him, and comedies centering their appeal about such characters are likely to fail dismally in their purpose. Sub-titles must be discounted as a means of conveying humor, since in translation they often lose all their wit, especially if a slang expression is involved. Thus it takes a discerning person and one acquainted with the Oriental temperament to pass judgment on what will and what won't cause a laugh. Dialogue came last to comedies because comedians needed it least. Stan Laurel and Oliver (Babe) Hardy are learning again the elementary truth that they are, first, last and always, pantomimists. Talk broke out like a rash in their initial sound films. Now they are grown monosyllable once more. It is a good thing for Messrs. Laurel and Hardy that they have not much to say. Because, aside from the fact that their voices are no world beaters, they are being required to speak every word in English, French, and Spanish—with German to be added in their next effort. An immediate advantage of this, a casual visitor to their set discovers, is that they are provided with new leading ladies for each language. Anita in English; Georgette in French, Raquel in Spanish, At the moment it was Georgette. “Ah, vraiment,” said little Stan Laurel to Georgette, and shaking his head sadly, muttered, “Tiens, tiens, tiens.” The camera whirred on and Laurel’s voice crinkled in the old familiar manner: It seemed just as funny a crinkled face in French. Stanley, as his friends call him, is rather more active than his rotund partner in devising new laugh formulas for their comedies. With James Parrott, who directs most of their pictures, or Ed Kennedy, who directs a few of them, Stanley develops a single promising situation into a two-reel story. Mr. Hardy sits in, and nods yes or no occasionally. Most of the speeches are written on the set, as need arises. Nobody on the Hal Roach lot takes credit for discovering the potentialities of the screen’s funniest team. Three years ago a broken leg removed a comic from a picture in which Mr. Hardy was playing and another was hurriedly called in to take his place. 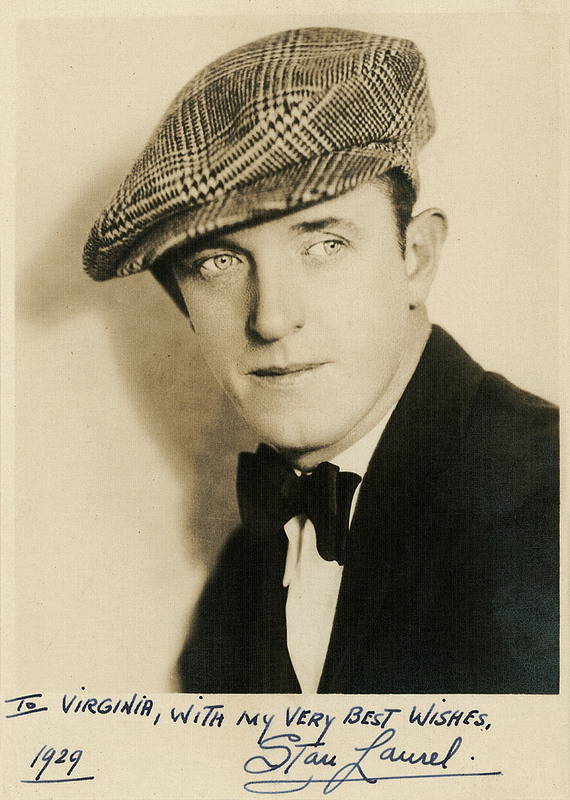 The comic who filled the breach was Stan Laurel, who hitherto had been acting and directing with fairish success. The fairish success in almost no time became phenomenal. It was Laurel’s faith in the efficacy of pie throwing which turned the trick. Pies had been thrown, to be sure, on the Roach lot before. They were being thrown, even in the comedy which Lionel Barrymore acted for Roach about four years ago. But only in moderation—one, two, perhaps three pies, and that was considered enough. Roach’s comedies were “clocking” on an average of fifty laughs in those days. Laurel approached the supervising director one morning and shyly suggested a way to raise the ante to eighty. His method would consist, simply and directly, of throwing more pies. Not one, not two, not ten or twenty, but hundreds, even thousands. There was nothing else—just more pie throwing, and Laurel couldn’t have that. The supervising director in time moved away into the feature field, and Laurel, sensing his opportunity, took his grand scheme to Roach. The producer, inclined to be generous with his brand-new comic team, agreed to it as an experiment. So “The Battle of the Century” was made, and with it history. The checkers, scarcely crediting their ears, clocked 110 laughs. “It wasn’t just that we threw hundreds or pies,” Laurel explained, “that wouldn’t have been very funny; it really had passed out with Keystone. We went at it, strange as it may sound, psychologically. We made every one of the pies count. This is what the innocent bystander did in “The Battle of the Century,” and audiences, sensing keenly his plight, relished it and his reaction to it. Thus a new “slow-slapstick” formula, which was really an old formula reapplied, came into existence, and Roach, Laurel and Hardy prospered. The highest total of laughs in any one Laurel-Hardy comedy was reached during a clocking or “Habeas Corpus,” the action of which took place largely in a graveyard. One hundred and twenty-eight unmistakable cachinnations were registered by this one. One hundred and three is the total made by “Night Owls,” currently on view at the Chinese Theater. Mention of this film led Laurel to comment on future plans. “We are very anxious,” he said, “to send out our pictures in whatever length they reach when they are completed. Nineteen hundred feet is the usual length for a two-reeler, and it necessitates some regrettable cuts. We were compelled to eliminate much of the business leading up to the big laughs in ‘Night Owls’ and the laughs themselves suffered by it. Comedy, especially our type of comedy, must be cumulative In effect, not abrupt. “So it may be that we shall make arrangements to release our comedies in whatever footage they show to best advantage, from 1900 up to 2500 feet. The early Harold Lloyd films varied In the same way.